Why drink regular coffee, when you can drink Super Coffee? Brew something good with the ultimate 6-pack of our superfood-infused coffees. 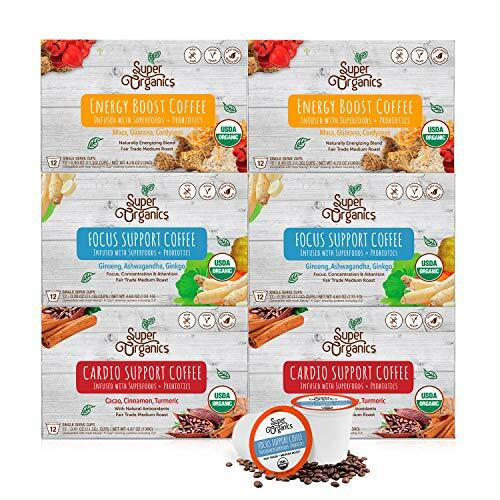 Each pack contains three varieties: Cardio Support, Focus Support, and Energy Boost, all USDA Certified Organic with fair trade beans, artisan roasted in small batches for robust flavor. These beneficial blends are also enhanced with powerful probiotics for digestive and immune health support. Worried about waste? All Super Organics brew cups are proudly made using recyclable capsules and eco-friendly materials, with biodegradable grounds and filter.